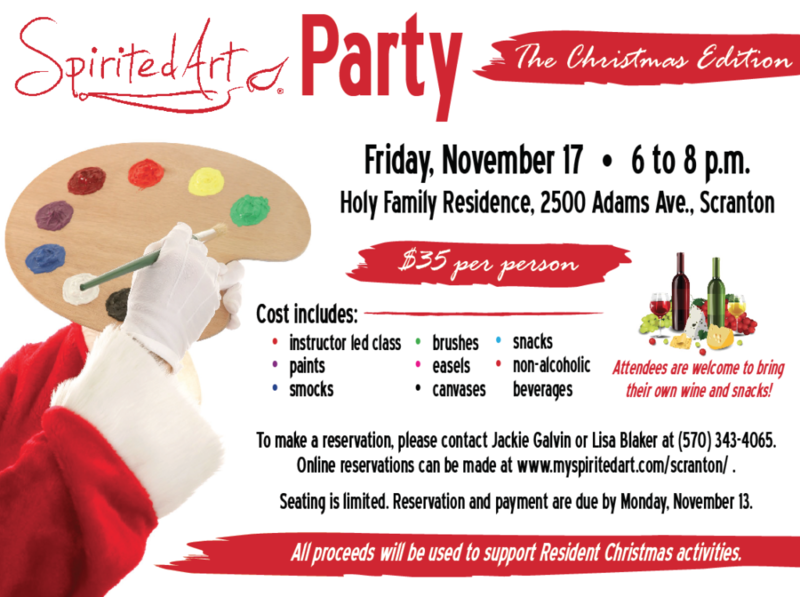 The Little Sisters of the Poor will host a Spirited Art party from 6 to 8 p.m. Friday, Nov. 17, at Holy Family Residence, 2500 Adams Ave., Scranton. Spirited Art, which is a very popular program for creative and non-creative types, provides individuals and friends an opportunity to create paintings while sampling beverages and snacks such as wine and cheese. The cost is $35 per person and includes an instructor led class, paints, smocks, brushes, easels and canvases. The Little Sisters also will provide snacks and non-alcoholic beverages. Attendees are welcome to bring their own wine and snacks as well. Seating is limited. Reservations are due by Monday, Nov. 13. To make a reservation, please contact Mrs. Jackie Galvin, M.S., director of development and communications, or Mrs. Lisa Blaker, director of activities and volunteer coordinator, at (570) 343-4065.